I am pretty cautious when it comes to putting products on my face. For many years my skincare consisted of the same face wash, the same moisturizer and eye cream. I refused to let ANY facialist touch my face for fear of skin reactions. But as I got older, I have discovered lots of fantastic products and do notice the benefits of regular facials and a good face mask. Dryness is a common problem women face, I am no different. I picked this up in Paris after hearing a lot of good things about the brand. It didn’t disappoint. The mask has a lovely subtle scent that reminds me of being at a high end spa. The main ingredient is grape seed oil, an antioxidant and the product is free of parabens. It has a smooth texture that’s not too heavy yet does the job to moisturize skin. 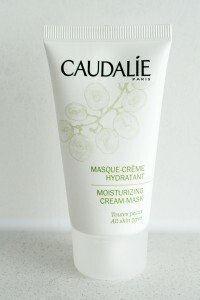 Best of all its gentle and doesn’t cause breakouts nor irritate skin. After leaving it on for 15 minutes, then wiping off the excess, my skin felt instantly hydrated and soothed. My skin will have a nice dewy sheen yet doesn’t make me look like an oil pit. Going into the dry autumn months, this has helped maintain my skin. For all skin types.